Gd5(Si\rm xGe1 -\rm x)4 has a complex magnetic-structural phase diagram which can be divided into three distinct regions. It exhibits an unusual first-order coupled magnetic-structural phase transition in the region \rm x < 0.51. A series of magnetostrictive strain measurements were carried out as a function of magnetic field strength at different temperatures and as a function of temperature at near-zero magnetic field strengths. In this paper, we report for the first time the observation of fine structure in the variation of strain with magnetic field near the first-order phase transition temperature. This fine structure was observed only for the single-crystalline and polycrystalline samples of Gd5 Si 1.95 Ge2.05 but not for Gd5 Si2 Ge2 and Gd5 Si2.09 Ge1.91 samples. There was a sudden increase of about 200-300 ppm in the magnetostrictive strain just prior the field-induced first-order phase transition. In this paper, this anomaly is termed as fine structure. It was observed in measurements of both magnetostrictive strain versus magnetic field and magnetostrictive strain versus temperature. In the case of the polycrystalline Gd5Si 1.95Ge2.05 sample, this anomaly was not as sharp, and the sudden magnetostrictive strain change was about 40 ppm just before the field-induced first-order phase transition. 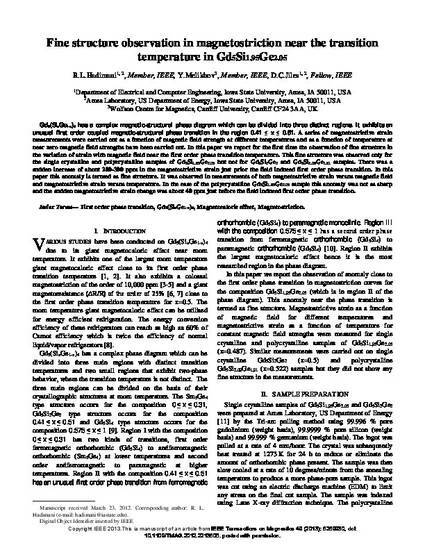 Copyright IEEE 2013.This ia manuscript of an article from IEEE Transactions on Magnestics 49 (2013): 6269930, doi: 10.1109/TMAG.2012.2213605. posted with permission.